With the number of prescriptions written yearly on the rise, it's more critical than ever for mental health professionals to understand how psychotropic medications work, where in the body they work, and why they do (or don't) improve your clients' therapeutic outcomes. Are you confident in your role as both the patient advocate and protector to effectively address medication assisted treatments in your overall care plan? Based on 20+ years of experience in the medical-consulting field, expert instructor Perry Buffington, Ph.D., M.S., will guide you through the newest advances and contemporary trends in blending medication management with psychotherapy interventions for ADHD, depression, anxiety, psychotic disorders, substance abuse and more. Together, you'll explore medical drug emergencies, how nutrition and herbal supplements impact medication effectiveness, and the psychopharmacological ethics you need to know to best protect your clients. You'll also learn specialized guidelines for geriatrics, pregnant or nursing women, and clients with chronic pain. Don't wait to get the knowledge you need to know to answer your clients' questions, manage side effects, understand medication reactions and improve your treatment outcomes. Earn up to 18.25 CE Hours — included in the price! Ethics hours are available! Click here for total course CE Credit. Get the up-to-date medication information you need to improve your treatment outcomes. Through three comprehensive video modules, Dr. Perry Buffington will show you the latest advances in psychopharmacology and contemporary trends in medication management. In addition to a foundational review of medications, you will examine case examples, discuss medication controversies and learn how to effectively collaborate with prescribing practitioners. Dr. Buffington’s years of work in mental health combined with his engaging presentation style, make this complex topic understandable, applicable and useful. With an emphasis on the experience and safety of the client, you'll get the step-by-step guidance you need to comfortably, confidently and safely help your clients using medication. 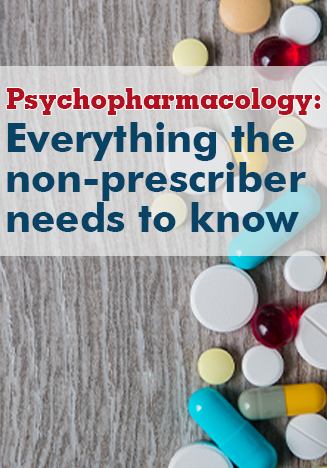 In Module One, Dr. Buffington will begin with the basic knowledge of psychopharmacology that all non-prescribing providers need to know. Together, you'll review the many options your clients have for both medication and/or psychotherapy. You'll also start exploring how drugs work, where in the body they work, and why they work (or don't work!). Leave this module with a mastery of the foundational skills you need to better protect your patients using medication. In this session, you'll take a deep dive into the neurochemistry and medication management strategies of specific disorders. Dr. Buffington will also explore side effects, including where unusual and common side effects come from, so you can ease their impact and help your clients achieve optimal results from their medication care plan. In the final module, you'll learn how to distinguish the unique medication considerations for special populations. You'll also learn to differentiate between acute vs. chronic pain and the ethical issues surrounding the everyday practice of clinical psychopharmacology. You'll leave this module confident in your ability to effectively address medication assisted treatments into your overall care plan with an understanding of your role as both the patient advocate and protector. Pain vs. depression: which comes first? please see the full course outline here! Enroll today and you'll get these TWO FREE BONUSES (A $54.98 value)! This unique and practical book will assist you in gaining a comprehensive understanding of the mechanisms of action, clinical applications, common adverse effects and risks of the medications most frequently prescribed in the contemporary treatment of psychiatric disorders. You'll get the psychopharmacology guidance you need in practical, clinically relevant language that will move you through the maze of mental health medications and help you identify ways to use your expanded knowledge to improve client outcomes. As the author of eight books (currently working on his first psychopharmacology text), his by-line has appeared in hundreds of periodicals including the Saturday Evening Post, USA Today, and Success. He is the former contributing editor for Delta Air Lines’ in-flight magazine, Sky, and served as a syndicated newspaper/web columnist for Universal Press. Additionally, he hosted his own radio show, syndicated nationally, by Envison Radio Networks. Perry’s presentation style is engaging, a blend of education and entertainment; as a result, critics (and especially his students) applaud his ability to make complicated topics understandable and applicable – even useful! Financial: Perry Buffington is the President of Go-Buff Enterprises, Inc. He is a member of the psychology faculty, Franklin College of Arts & Sciences, The University of Georgia. Dr. Buffington receives a speaking honorarium from PESI, Inc. Nonfinancial: Perry Buffington has no relevant nonfinancial relationship to disclose. Watch your email for your order confirmation, and get instant access to all 3 modules of comprehensive training plus the FREE Bonus materials — all designed to help you effectively integrate psychopharmacology knowledge into your practice. Review all the course materials at your own pace and at your convenience! Click here for course objectives and outline. Instantly collaborate with other professionals on the course materials through interactive message boards. You'll be part of a community of hundreds of practitioners all focused on understanding psychopharmacology, providing valuable opportunities to share insight and experiences and to build your professional network. Complete your online CE tests and earn up to 18.25 CE Hours! Click here for total course CE Credit.